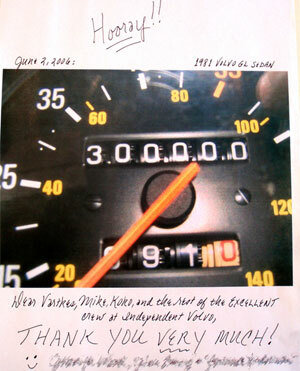 Dear Vartkes, Mike, Koko, and the rest of the EXCELLENT crew at Independent Volvo, THANK YOU VERY MUCH! A review from YAHOO! Local... An honest place to get your car worked on. Dedicated and Skilled, great service, friendly staff and skilled technitcians. They've kept my '96 850 purring. Vartkes always informs us of our options, suggests the most cost effective solutions and... the one time he made a mistake, he fixed it, no questions asked. Couldn't ask for more!